Major Easterly Wind Event - Hi, friend Climate and Weather Information, in this article entitled Major Easterly Wind Event, we have prepared this article well and concise to be easy to understand for you to read and can be taken inside information. hopefully the contents of the post that we write this you can understand and useful. okay, happy reading. 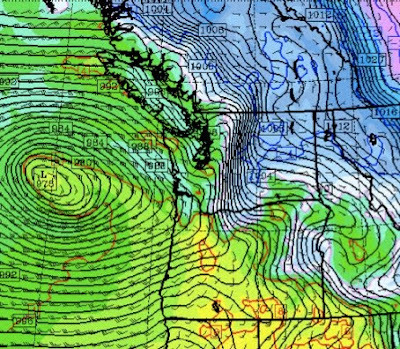 Strong winds over western Washington and Oregon are almost always out of the south, the product of low pressure centers moving up the coast and/or making landfall to our north. On rare occasions (like on Nov 22 with the cold outbreak), we can get fairly strong northerly winds as cold air pushes southward during an "arctic blast" situation. But there is another direction that can bring very strong winds, but only for certain foothills locations and very specific situations---easterly winds. And yesterday such an event occurred. Winds gusted to 70-80 mph at foothills locations like Enumclaw and Black Diamond, and a swath of 50-60 mph gusts extended westward over southern King County. North Bend and Snoqualmie Summit are other windy locations. Lesser, but damaging easterly winds also occurred in parts of Seattle. 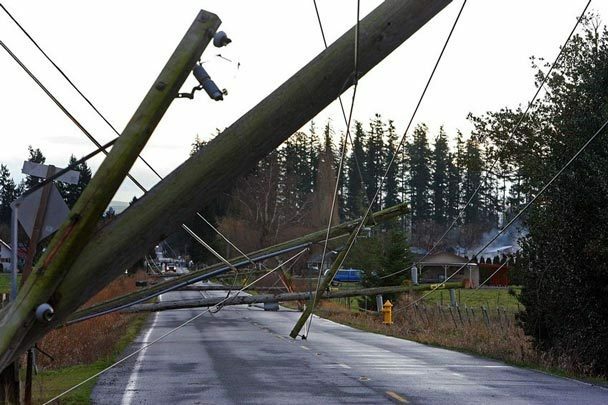 Roughly 100k customers lost power in the Puget Sound region, and power outages also occurred near Portland due to flow accelerating out the Columbia Gorge. This is probably a 2-5 year easterly wind event. Not the biggest by any means. The big kahuna event was December 24, 1983. Winds gusted to over 120 mph in Enumclaw and the damage was extraordinary--roofs off hundreds of buildings. Easterly winds are relatively rare in our region for a few reasons...but the major one is that we have a major mountain barrier...the Cascades..that block flow from the east for most situations. However, if you look at a good terrain map of the region, it is clear that Cascades are not uniform--there is a major sea level gap in the Columbia Gorge and a weakness in the central Cascades called Stampede Gap (my book has some good topographic maps and talks about all this if you have it). Under the right conditions air can push through Stampede Gap and accelerate as it descends into the lowlands...late Friday and Saturday were such a day. You want a large pressure difference across the Cascades, strong flow striking the Cascades from the SE, and for reasons I will explain, a wind reversal above the mountain crest and often a layer of stable air there as well. Here is a surface chart for 4 AM on Saturday. You can why we had this event....a low center moving northward off the coast and high pressure inland. The lines are isobars....lines of equal pressure. There is a huge pressure difference across the Cascades and this configuration also produces strong SE winds at crest level. At the height of the event there was over 10 mb of pressure difference across the Cascades (this is quite large). Research has shown that the strong winds along the eastern slopes of the Cascades are not simply winds accelerating from high to low pressure. In addition, with a wind reversal or layer of stable air above crest level, the development of a high-amplitude mountain wave adds more "juice" to these events. I don't have the space to explain this in the current blog, but think about high amplitude versions of the waves in the lee of mountain barrier that produce lenticular clouds or the water descending down a dam. Current generation high-resolution computer models do a pretty good job with such events and the National Weather Service did an excellent job putting out a high wind warning before the event. I should note by the way, that there were also strong winds in the western Strait of Juan de Fuca and along part of the coast, and the warnings included that. Here is a sample of a computer forecast made early Friday, verifying at 7 AM Saturday. Wind gusts are shown by the shading. You can see the strong winds in southern King County and the accelerating winds in the Strait of Juan de Fuca and the strong winds offshore. Finally, I should note this was also a major wind event in the Gorge and winds in the Portland area accelerated to 40-50 mph. This winter is one that keeps on giving...at least meteorologically. Thank You and Good article Major Easterly Wind Event this time, hopefully can benefit for you all. see you in other article postings.